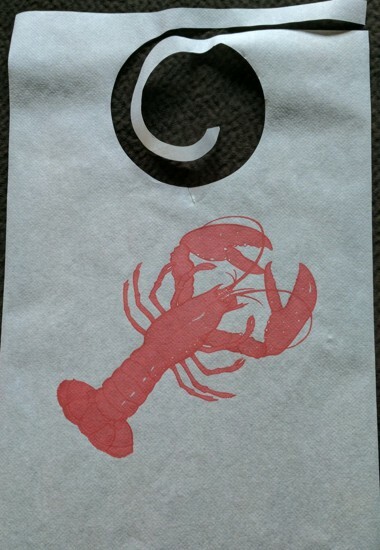 - The large red/black CRAB is pre-printed on the bibs. - Poly backed paper, this is a waffle texture white paper bib with plastic backing and ties. Ties are die cut around the neck. - Bib imprinted on the wearer's right side, top as shown, printed on hand gig, location of imprint on the neck hole in relation to the neck hole/design may vary. - *Pantone numbers listed are approximates, imprint ink coverage, the absorbency of the bib and the drying process may change the appearance of an ink color. 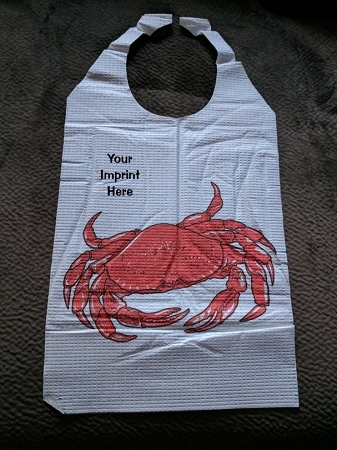 - Random Imprinted Bib Sample, click for order form. Any concerns must be addressed prior to final sale purchase.